Star Lifestyle has, over the years cultivated an urbane, glamorous image. We've focused on shopping, eating out, fashion, home décor…all the little pieces that make up the busy, demanding lives of city dwellers. The challenge of getting through the nitty-gritty of each day, has made us oblivious to the lives of others, those less fortunate than ourselves. The cyclone that hit the coastal belt last week proved to us just how self-absorbed we have become. It was an eye-opener that forced us to realise that we are not isolated beings, that we are connected in one way or the other. This is not about lamenting our losses, however. Our photographer Sazzad Ibne Sayed and reporter Mannan Mashhur Zarif visited the Sidr-affected areas, and brought back stories, not only of the enormity of the devastation, but also of the remarkable resilience of the victims. Losing everything, they have not given up, and are clinging to life with admirable tenacity. In the second stage of our special post-cyclone coverage, we at Lifestyle salute the spirit and determination of those worst affected by the storm. The villages of Rainda and Southkhali lie in the southernmost region of Bagerhat, Khulna, about thirty kilometers from the last bus stoppage, Morolganj. The region experienced the torment of cyclone Sidr, the worst climatic disaster the country has experienced in recent times. People of this region are mostly fishermen, who harvest the spoils of the sea. These men respond to the call of the water and venture out in the open waters, netting hilsha for their livelihood. Over the last one week, however, following the aftermath of Sidr, these resilient souls have spent their days and nights under the canopy of the November sky. The relief workers have done their best, but sometimes best isn't good enough. Under the shade of a tree that managed to withstand the wrath of Sidr, Sabiha Khatun was cooking her first proper meal in a week. Seeing the two journalist approach her, Sabiha Khatun broke down in tears and could only utter "Amar teenta goru nai" (I have lost three cows). Slowly she opened up and narrated the loss of her son and only grandchild. “We were all inside the house when the cyclone hit us. The news was on the radio and my son did not sail into the sea. It was Thursday evening when the storm became ominous. The winds grew stronger. Even a few minutes before the tidal waves, the water seemed calm. But then I saw a 'spark' in the sky and high waves hit our shores. We all climbed trees as the water began to rise. I grabbed a branch of the tree and remained there for hours until the water ceased its splashes and the wind ceased. I don't know what happened to my son or my grandchild. They were just gone with the waves I think." Every individual of Rainda or Southkhali has a story to tell; a morbid story that will shock townsmen like ourselves. But these people have battled the odds of nature for generations. To them life is a cycle of happiness and despair. Ratan Howlader, a fisherman has lost one trawler and two boats. He has nothing left in this life. Sidr also took away his beloved wife and a small child. He narrates the story of his loss to journalists with a tone devoid of emotion. "I need to work. But all my possessions are gone. I had my own business, now I will have to work for others for my living" says Ratan. Moving left of the cross road of Rainda and Southkhali village, we saw some signs of life. A few people were gathering what was left of their houses and tried to put a roof beneath the sky. Another group were busy in an attempt to float the lone boat that survived Sidr. At a glance, it may seem that this area had escaped the cataclysm of Sidr, but this was far from reality. 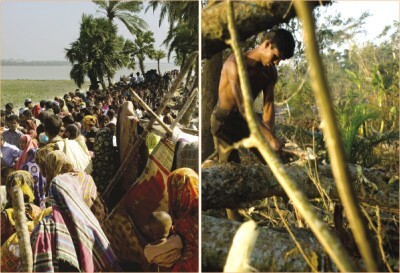 To the elders of the village, Sidr is yet another cyclone that has ripped their lives apart. For the young it was a 'false alarm' went wrong. The apparent apathy towards the loss of human lives, speaks for the resilience of these people and not a lack of emotion. Just as we were about to leave the village, an elderly man requested us to take a photograph of a dead woman they had found in the ditch. We complied, for it was the least we could do. It is hard for us to imagine what it must be like for these people, living as comfortably as we do in the city. Yet for people like those that we met in the coastal areas, battling nature is a way of life for them. Sidr is a set back in their lives, a huge setback, but looking at the way they refuse to give up, gives us reason to hope that they will recover from their losses and go on. All they need is a hand to help them up, and we should soon see the sails striking out to conquer the seas once more.